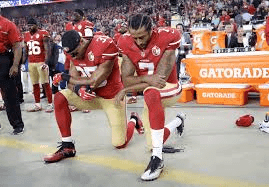 Athletes’ protest is completely respectful and acceptable. I read an article where an NFL player claims that the action of other players kneeling or sitting during the national anthem is disrespectful and should never be done. However, This is not disrespectful because no one is disturbing peace. It is, in fact, a form of peaceful protest. Procon.org gives a view from both sides of the debate. So, even though I am all for the kneeling, the website gives great understanding on why some may find kneeling inappropriate. They say that kneeling is disrespectful to members of the military because instead of showing appreciation, we are going against them. Kneelers are not directing their frustrations to troops, but to the issues that the country’s (that they are fighting for) major issues that are being swept under the rug. Why should we show pride and honor to a flag that represents a corrupt country that goes against its own beliefs of freedom and equality ? The First Amendment states that “Congress shall make no law respecting an establishment of religion, or prohibiting the free exercise thereof; or abridging the freedom of speech, or of the press; or the right of the people peaceably to assemble, and to petition the Government for a redress of grievances.” People being punished for refusal to stand is just another reason to protest. If we, as US citizens, are granted the freedom to protest, then why are protesters losing their jobs, & being expelled from school ? This just goes to show how contradicting America really is and how we really do not have all the freedom that is claimed . Karen Hunter tweeted “as long as we stay ‘in our place’ everything is fine” This quote is very powerful and speaks truth. Everyone is aware of the racial injustice and police brutality in our country. It has been an issue since forever ago. Every time there public protest on the topic, its a problem. Officials want to keep the problem as discrete as possible. They want the public to remain silent about the problem, that way , nothing changes. Systematic racism will remain if awareness isn’t raised. Protesting Shall Continue by Jada is licensed under a Creative Commons Attribution-ShareAlike 4.0 International License.